China, a land of beauty and fascination, tempts adventurous travellers all over the world. China has a five-thousand-year history, and there are many tourist attractions that are worthy of being visited.Beijing for example. 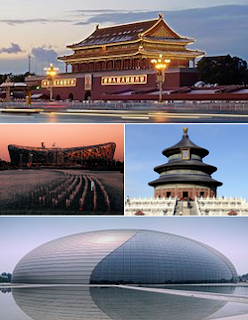 It is the capital city of China, inside of which you are able to see the forbidden city, that is full of ancient artifacts and collections, and also the famous great wall of china that is made of rocks, and was built thousands of years ago.Moreover, it is the only structure on earth that you can see from the satellite.Apart from Beijing, there are also many attractive and historical places, such as Xian with rock-made ancient soldiers' sculptures, Xitang with the beautiful ancient towns, and also Guangxi with many exotic minorities.China is the fourth largest country in the world, with many different types of scenery. If you want to go to the beach and enjoy the sunshine, Hainan will be your best choice, because it has a fabulous blue sea and beautifull beaches with golden sands. If you want to climb mountains and experience some exciting adventures, you will have a numbers of options to choose from, like Yellow Mountain, Tai mountain, etc. Many of them have interesting ancient fairy tales, about the strange-shaped rocks: If you want to gamble and have some exciting night life, Macao will be the first place you should go, for it is one of the biggest gambling cities in the world.If you want to go in Beijing upon arrival at the airport in Beijing, you will be met by the guide and transferred to the comfortable hotel. And then, you could have a great rest at the hotel or go to touch the city first by yourself. Amazing sightseeing starts from paying a visit to the world grandest city square – Tiananmen Square, a frequently viewed scenic spot all the year round. When walking through the square, you might find the majestic forbidden city not remote. As an imperial palace existing for nearly 500 hundreds years, the Forbidden City consists of 8707 rooms and is regarded as the biggest as well as best-preserved royal architectural complex. Then, get on a rickshaw to explore the narrow and clean hutongs and visit the local family as well as have a dainty lunch with the family members. At afternoon, go on to explore the picturesque summer palace.When you will reach in Xian then highlight today is the world-famous Terra-Cotta Warriors and Horses where you might be shocked by the rows of life-size warriors in order. After a local dainty lunch, make a stop at the square infront of the Big Wild Goose Pagoda and choose the best angle to view this "Leaning Tower of China". As walking around the square, you can also appreciate the exquisite architectures and sculptures on its two sides.The tour of Guilin is enough amazing. When cruising down the Li River, you would be fascinated by a picturesque view seen only on photos. If you wish to get a glimpse of Chinese country life, after disembarking, the dream would come true because you will be arranged to take a battery car to go through the local countries and fields to experience really fresh rurality. Finally, go back to Guilin. The lunch is to be eaten on board. In Shanghai the first sightseeing stop is the Shanghai museum where you could see lots of splendid Chinese treasures, and then you will take a walk around the Bund. After lunch, continue to visit the Yuyuan Garden and Bazaar. Finally, roam the Tianzifang, a neighborhood with clean alleyways and featured stalls, restaurants, cafes and shops of selling artwork.